Basilan is an island province of the Philippines in Mindanao, just off the southern coast of the Zamboanga Peninsula. Basilan is the biggest and northernmost among the major islands of the Sulu Archipelago. Basilan has a variety of natural tourist spots that dot the island's pristine beaches and cool inland resorts, it has a peninsula point called punta matangal in tuburan that offers a haven for surfurs very similar to that of the northshore of Hawaii. Basilan has gradually evolved into a charming, even surprisingly hospitable place were we could relax and enjoy a laid back, stress-free vacation. There are three main ethnic groups; the Yakans and Tausugs are predominantly Muslim, while Chavacanos are primarily Christian. The lingua franca is Chavacano, a Spanish creole dialect, understood by more than 80% of the population. Tagalog/Filipino and English are also widely spoken and understood. Access to the island province is usually through Zamboanga which lies 17 nautical miles (narrowest point of the Basilan Strait) due north. From there, a boat ride of 1 hour and 45 mins (for conventional passenger ferries), will take you to Isabela and Lamitan. The fare ranges from Php20 (student and senior citizen's discounted fare on some conventional ferries) to P70 (first-class w/ aircon). Another fastest way to the location is by taking the "Fast Craft" which will only take about 45 minutes boat ride. Basilan joined the "Western Philippine Nautical Highway" through the construction of three (3) new Roll-On-Roll-Off ("Ro-ro") Ports located in the cities of Isabela and Lamitan, and in Port Holland, Maluso. A regular four door sedan is charged Php2,500.00 per trip, a Van/Light Truck Php3,500.00, while bigger trucks/heavy equipment may go up to Php5,000.00 per trip. Basilan is served by several light plane landing fields located in Isabela (2), Lamitan (1), Maluso (1), Lantawan (1) and Sumisip (1), all of which were constructed and maintained by the multi-national plantations and have since been turned over to the Farmer Beneficiary Cooperatives. The lingua franca is Chavacano, a Spanish-based creole language, understood by more than 80% of the population. Tausug is widely understood and spoken by the island's Muslim denizens, along with Yakan. Cebuano is also understood to a smaller extent, as is English. Yes - Si! No - No! Good morning! - Buenos Dias! Good Afternoon! - Buenas Tardes! How are you? - Quetal 'tu? Here - Aqui There - Alla I'm hungry! - Con hambre yo! I'm sick! - Infermo yo! Help! - Ayuda! Where can I eat? - Donde yo puede come? Where is the Hotel? - Donde el Hotel? Where's the toilet? - Donde el CR? Where can I have fun? - Donde yo puede man gimik? How much is this? - Cuanto 'ste? How much is that? - Cuanto 'se? Its too expensive, can you give me a discount? - Bien caro, tiene pa rebaje? When does it (do we) leave? - Cuando 'quel (kita) larga? Thank you! - Gracias! A definite recommended "buy" would be the intricate Yakan weaves, trinkets and souvenir items usually made of woven material and hammered brass/bronze pieces, with colorful beads and hand-painted wooden bangles, rings, and handcrafted Yakan bags, table-runners, wall-decor, etc. 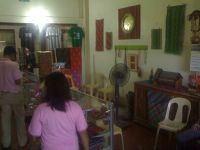 Be sure to visit the Isabela City Pasalubong Center for authentic Yakan craft (1/F, J. S. Alano Zenith Bldg., J. S. Alano St.). Since you're already in Basilan, don't miss out on the "Basilan Brew" coffee available in nearby Lamitan town (only 45 minutes from Isabela City). A number of retail establishments may likewise be visited before 6:00PM (traditional closing time). Sumptuous local delicacies may likewise be sampled. Not to be missed are hearty Muslim dishes such as "tyula itum", "pianggang manok", "baulo", "kulma", etc. Certain Yakan festivities likewise prepare a pyramidal "dullang" with the delectable mountain rice "sappul"
A number of Hotels, Resorts and hostels likewise dot the City of Isabela. The Farmland Resort (Lanote), Anson's Hotel (Sumagdang), Hotel Royal Issra (Marketsite), Casa Rosario (Port Area), Basilan Hostel (Eastside), Buwalan Beach Resort (Sumagdang), ISAWAD Pool Resort (Cabunbata), Basilan Hotel (Isabela Proper), Grino House (Menzi). And Sofia Hotel (Port Area). Hja. Gigi Carama-Junudi, Basilan Provincial Tourism Officer, Provincial Capitol Building, Isabela City, Basilan. Jayson Tubil, Isabela City Tourism Officer, Isabela City Hall Complex, Isabela City, Basilan. Pilar Raga, Guest Liaison Officer, "Isabela City Pasalubong Center", Basilan Chamber of Commerce & Industry, Inc., J. S. Alano Bldg., J. S. Alano St., Isabela City, Basilan. This page was last edited on 20 August 2018, at 09:24.